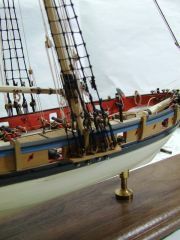 Sailing vessels from the 17th to the 19th century. Interested in all-wood ships only, no metal-hulled vessels. Any one for a Cruise? Honestly, if I were to go on a cruise, I would go on a historical cruise, where I get to sail on a wooden sailing ship like the Mayflower II or the Lady Washington. At least then, I'd actually get to have the genuine sailing experience and FEEL the sea around me. A modern cruise ship is nothing more than Las Vegas encapsulated in a gargantuan metal container. 2012 and 2013 have NOT been good years for the cruise industry, have they? The funny thing is, right after the Costa Concordia accident, we got an advertisement for a Carnival Cruise in the mail, lol. Nice work... I happen to like this ship. Wow... very nice work... and the interiors! I like your attention to detail... a great build so far!